To effectively coordinate, both gas companies and municipalities must have the appropriate structures in place to build upon and utilize. Feedback from municipalities shows that gas company staffing and communication issues are a source of municipal frustration and an impediment to coordination. Municipalities also need to improve communication to ensure that departments like Water and Sewer, which might be separate from Public Works, are effectively included in the coordination process with the gas company. Additionally, municipalities need to develop their own multi-year infrastructure plans and track completed work; without this information, gas companies have extremely limited ability to align their infrastructure plans with municipal work. Finally, municipalities could position themselves to more effectively use their own plan data and shared data from the gas company by leveraging existing technologies. The municipality and gas company should meet to have a one-on-one meeting in person ahead of the construction season. The meeting will serve to: Introduce all participants in the coordination process for gas company and municipality Compare infrastructure plans and identify opportunities for aligning schedules Establish communication procedures for the construction season Establish clarity on restoration, paving and inspection procedures in late February - This provides sufficient time for parties to update plans and allow opportunities before construction season to accommodate changes in schedule. See Share & Strategize and Generate & Capture Savings for pre-construction season meeting details. Key representatives should include: Community liaison (i.e. point-person) and managers for gas main planning, gas main construction, gas main maintenance (i.e. leak repair), and new services. Municipalities frequently reported having old or obsolete contact information, often due to high rates of staff turnover at the gas company. An online list would eliminate the hassle and confusion municipalities currently report when trying to find the correct contact, and it would increase the likelihood that the right person at the gas company receives the information. Provide contact information or an email submission form along with the online contact list. When key representatives are overburdened or not performing, municipalities should have a way to notify the supervisor. This can provide valuable feedback to the gas company and an opportunity to direct the municipality to the correct point of contract, rather than having them scramble to find alternates. Municipalities reported delays with the gas companies that may be attributed to excessively large territories and workloads for key representatives. As coordination efforts increase, gas companies should evaluate whether staffing levels effectively support the necessary work, and make adjustments if needed. Municipalities cited high rates of staff turnover in key representative positions as a source of frustration and complication for their coordination efforts. Turnover makes it challenging to accumulate knowledge relevant to the municipality and build trust. Using strategies like bonuses, awards, or internal recognition may be useful ways to encourage representatives to stay for at least two construction seasons. 5. Implement a standard transition process for key representatives. Some turnover is inevitable. When that does occur, a company-wide policy for managing the transition, including whether or not an in-person, phone, or email introduction is made and when, will help ensure continuity and minimize chances for municipal frustration and missed communication. 1. Establish policy to coordinate paving, water, and sewer infrastructure planning efforts internally. Gas companies reported that one or more of the departments with infrastructure responsibilities outside of paving, such as water and sewer, often do not participate in the coordination and planning process. For successful coordination, all these departments - whether housed under a single Public Works department or not - must work together to participate in planning and coordination efforts with gas company. It may be necessary for one department to take the lead on interacting with the gas company and organizing the municipal departments. This information should be requested if not already provided through through a website by the gas company. Municipalities often utilize relationships with gas company staff in various departments. However, this can result in information getting siloed in just one department. The gas companies key representatives will know how to move information around to the other parties in the gas company that may need the information. Driving communication through them will help maximize the chance that all relevant parties get information and updates. Contracts should require a minimum of two weeks notice for schedule changes. As more municipalities implement this, it will become the standard, rather than the exception for paving contractors. Columbia Gas has reported initial success with some of their municipalities using such contract language. Municipalities and gas companies reported that paving contractors routinely change schedules with little advanced notice. When schedules are moved earlier, gas companies cannot always adjust to survey and repair gas leaks, replace their leak-prone mains, or raise gas gates. This results in excess cost and missed opportunities to address leaks. 1. Maintain three year plans for paving, water and sewer infrastructure upgrades. 2. Update annually list of completed paving, water and sewer projects. List should show the year the street was paved and preferably be mapped using GIS. Roughly a two thirds of municipalities surveyed were already maintaining such a list. 1. Coordinate requests for municipal data and sharing updates between departments. Coordination includes determining internal department needs for municipal plans and information and then assigning responsibilities for data requests. Municipalities reported instances of providing information to the gas company, but it appeared information was not appropriately shared with other groups. This led to duplicative data requests and information not being acted upon. to avoid duplicative requests and facilitate sharing of plans and updates to appropriate departments. 1. Acquire access to Geographic Information Systems (GIS). Software (i.e. desktop) and online-based options exist for GIS. GIS can act as a database to track municipal plans and completed projects, based on the street segments on which they occur. GIS also visualizes the plan in map form. This makes it easy to review location data for mistakes (such as repaving Main Street vs Main Terrace). And maps are useful for engaging the public and communicating plans. Additionally, GIS allows for efficient comparison of the municipality’s multi-year plans, as well as those of the gas company or other utilities. Through mapping and built-in analysis tools, GIS can identify areas of overlap between plans, even if they occur in different years. At a minimum, printing a paper map can make discussions with utilities more fruitful than trying to compare lists on a spreadsheet. GIS is commonly used by most municipalities in the study (92%). Unlike a standalone database, GIS has applications beyond roadwork coordination, making it a valuable acquisition for a municipality if it is not already in use. 2. 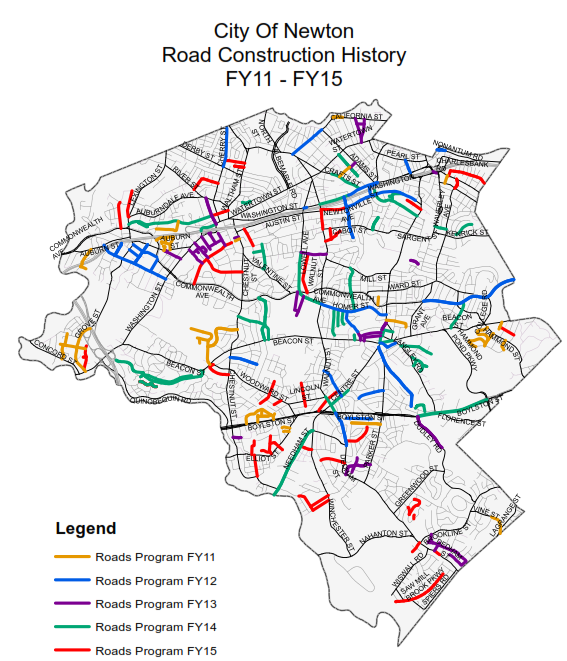 Keep paving, water, and sewer infrastructure plans in GIS and produce map. 3. Keep street-cut moratorium list in GIS and produce map. Database software allows access to users in addition to the municipality, such as the gas company and other utilities. Users input planned projects according to address segments, and the database can automatically identify shared opportunities or conflicts. The database can also include rules that ensure format and quality of data. However, a database was only used by the City of Boston in this study. The rarity of a database likely reflects the fact that 1) it is most beneficial in the municipalities with lots of projects and lots of parties to coordinate and 2) there is a substantial cost to developing or purchasing a database service. Municipalities could evaluate a database as a longer term solution if it fits their needs and funding can be made available. With communication systems, infrastructure plans and appropriate technology in place, the next step of coordination relies on sharing data between the gas company and municipality, identifying projects on which to coordinate scheduling, and establishing a process to keep both parties moving in sync over the course of the construction season. For gas companies, the shared data should include all years of gas main replacement plans, as well as background information on the existence of gas mains throughout a municipality and the location of gas leaks. For municipalities, it should include all years of its own infrastructure plans. Where possible and valuable, sharing plans in GIS should be offered by both gas companies and municipalities. Both parties need to be open to adjusting schedules to facilitate synchronizing projects on the same segment of road during the same construction season. 1. Request all years of all municipal infrastructure plans. Gas companies annually ask for paving plans from municipalities, but municipalities reported they are not usually asked for water and sewer plans. Also, some municipalities reported sharing only one year of plans because the gas company did not ask for multiple years. 2. Set reasonable deadline for receipt of municipal infrastructure plans. Suggest late-January to mid-February. Deadline must balance the municipalities’ need for sufficient time to update plans after the construction season ends in mid- to late- November with the gas companies’ need to receive plans with enough time to adjust their own. 3. Share all years of gas main replacement plans. Despite gas companies having gas main replacement plans for years 2 and 3, many municipalities reported only having access to one year of gas company plans at a time. Providing access to additional years will allow municipalities to incorporate it into their planning process. 4. Share map of municipal streets with existence of gas main and pipe material. The map should not include the level of detail necessary to locate the pipe in the street, pipe size, pressure or existence of other gas-system equipment. It is possible that such information could constitute Critical Energy Infrastructure Information (CEII) if shared for the entire municipality’s system. Providing such detail for the entire municipality could pose a security risk. In contrast, providing information on just the existence of pipe under a street and its material for the entire municipality’s system should not constitute CEII. Further, that data would suffice to be valuable for coordination because municipalities can use it to identify 1) which of their projects might encroach upon leak-prone pipe, forcing the gas company to replace it; and 2) which road segments are leak-prone and thus likely to be good sites of future coordination. Roughly half of municipalities interviewed requested such a map. See Case Study on City of Melrose to see how they are using this type of information. 5. For municipal engineering projects, share gas main location information. This information should include the level of detail necessary to locate the pipe in the street, pipe size, and existence of other gas-system equipment. Because it is only shared for small segments of the entire system at a time, this should not constitute Critical Energy Information Infrastructure (CEII). Municipalities need this detailed information to identify potential conflicts with gas infrastructure during the design phase for their infrastructure projects, in order to avoid expensive delays in the field and/or revisions to design. Dig Safe mark-outs happen only 72 hours at most before excavation, too late to inform this process. 6. Share gas leak data. The data is made publicly available each year on the Department of Public Utilities’ website when the gas companies submit their Annual Service Quality Reports. However, many municipalities are unaware that it is available and the format is often difficult to manipulate. Providing this data would increase transparency and help the municipality understand which areas are more and less leaky. List should show year paved and be updated annually. *Share in December or as soon as possible after the end of construction season. 2. Share all years of all infrastructure plans. This includes plans for paving, water and sewer projects. Gas companies recognize that these plans are often tentative, as funding, winter damage, emergencies and politics can change priorities. Some municipalities only shared one year of plans in order to “force” the gas company to focus on coordinating year one projects. While well intentioned, this severely limits the amount of advance notice the gas company receives and therefore limits its ability to adjust its plans in response. 3. Share any other “wish-list” information. If the municipality has other long-term infrastructure project goals, sharing this information may help the planning process for the gas company. 4. Share information on planned new developments as soon as possible. New residential and commercial developments may require new gas mains and/or updates to existing gas mains servicing the area. The municipality should ensure that the gas company is aware as early as possible. The municipality should also request an affirmative decision on whether work on mains will be needed. 5. Request gas main replacement plan. Ensure that the municipality receives an updated copy each year of the gas company’s gas main replacement plans, which should cover at least three years. 6. Request map showing existence of gas main on streets and pipe material. Use this information to proactively identify 1) which municipal projects might encroach upon leak-prone pipe, forcing the gas company to replace it; and 2) which road segments will need pipe replaced eventually. This level of detail - simply showing whether the street has pipe and its material, but not where in the street pipe exists or other aspects of the system - should not constitute Critical Energy Infrastructure Information (CEII) but should be sufficient to benefit the coordination and planning process. 7. For municipal engineering projects, request gas main location information. This information should have the level of detail necessary to locate the pipe in the street and determine its dimensions. This enhanced level of detail should not constitute CEII because it will only be shared for small segments of the system at a time. Use this information to proactively improve engineering designs and minimize the need for future change orders or in-field delays. However, remember that gas company data may not be entirely accurate, as the depth and location of pipes may have changed over time due to natural and human activities. Further, this information does not substitute for getting mark-outs from Dig Safe. 8. For gas company engineering projects, share water and sewer main location information. Provide the same level of detail as the gas company provides to facilitate their engineering and design process. This can benefit the municipality by reducing in-field change orders that might prolong the gas company’s work and therefore disruption to traffic. 9. Request gas leaks data. Data is publicly available each year in each gas companies Annual Service Quality Report and could be shared directly by the gas company as part of the overall data sharing to help the municipality better understand its infrastructure. 10. Request and offer to share GIS files for infrastructure and plans. Requested GIS files can include gas main replacement plans and the existence of gas mains and material type. Files can be easily opened in the same map as the municipality's plans to facilitate comparison. Offer to share street-cut moratorium list and infrastructure plans as GIS files. 1. Compare infrastructure plans for years 1-3. Occurs during pre-construction season meeting. 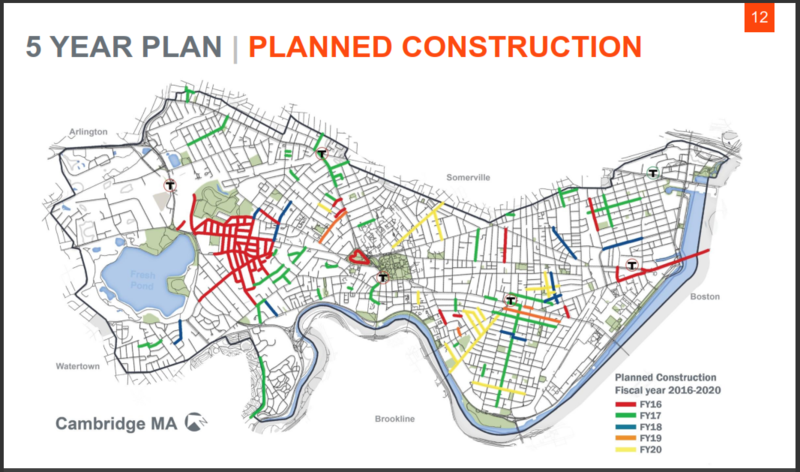 Both parties should bring infrastructure plans and a street-cut moratorium list to the meeting, and preferably have maps showing street segments coded by year. If possible, the parties could load GIS data onto the same map and look at it live on the screen together to identify overlaps and adjust plans. If possible, look at opportunities and plans for beyond year 3. 2. Agree on infrastructure schedule changes for years 1-3 that would benefit both parties. Planned work may overlap on the same street segment in the same or different years. For those in the same year, the project schedules should be adjusted, if needed, to allow the gas company to perform its replacement before paving. For projects planned for different years, the parties can decide if one schedule can be adjusted so that the gas main replacement can occur before paving. As previously mentioned, schedule changes for municipal work beyond year one may be affected by unforeseen circumstances. However, making a commitment to synchronize work can help maximize the chance that the municipal plans come to fruition, for example, by providing additional rationale for allocating or retaining funding to that specific project. 3. Define projects that need sequencing for the upcoming construction season. The gas company and municipality should be clear which segments of street the gas company needs to have access to before paving or other municipal work takes place. The municipality can then commit to prioritizing efforts to keep its schedule for those segments on track and update the gas company as soon as possible if changes are needed. 1. Develop program for other utilities to participate in plan sharing and project synchronization efforts. Like the Cities of Worcester and Cambridge, including additional utilities in regular meetings to discuss and compare infrastructure plans can generate additional opportunities for synchronization. Both Cities have been able to find these shared opportunities through regular in-person meetings where utilities and municipalities bring plans and discuss opportunities to adjust schedules. Both the gas company and municipalities have the ability to generate and capture financial savings through project coordination and adjusting trench restoration protocols. If appropriately captured, these savings can not only incentivize improved coordination, but can fund accelerated gas main replacement and additional paving projects. If funds will be exchanged, the municipality will need to sign some form of agreement with the gas company (bi-lateral agreement). The agreement can memorialize the coordination practices expected of each party, make official the restoration practices allowed, and specify how savings will be calculated and shared. Discussions about these procedures can happen over the off-season and at the pre-construction season meeting. Capturing these savings can provide an incentive as well as financial support, for a municipality to implement improved coordination practices. 1. Discuss trench restoration requirements of DTE 98-22 compared with municipal preferences. Occurs during pre-construction season meeting A permanent pavement patch uses a higher grade of pavement than a temporary patch and the permanent patch covers more surface area because it must be “cut back” wider into existing pavement. As a result, the permanent patch costs substantially more than a temporary patch. DTE-98 22 requires temporary patches be replaced after 2-5 days with a permanent patch, depending on the season. One implication of this is that, in cases where the municipality is synchronizing a paving project with the gas company, the gas company would have to install a permanent patch only to have it removed shortly thereafter during municipal repaving. Due to trench settling, some municipalities prefer that final patching occurs after a settlement period of 30 or 60 days, or even an entire winter season. In cases where the municipality will not repave, the 2-5 day requirement for permanent patches means that the gas company will have to install an initial permanent patch, then return to replace or repair it later on. Finally, some municipalities prefer that final patches use the “grind-and-inlay” method, rather than the “cut-back”. This impacts less surface area and has a lower cost as a result. 2. Agree to changes to trench restoration that are cost saving or cost neutral. 3. Schedule an early construction season check-in. 4. Determine frequency of other meetings during construction season. The gas company and municipality should have some regular communication during the construction season. The frequency, method (e.g. in person meeting or phone call), and staff in attendance should be determined based on the amount and complexity of gas main replacement work. In person meetings may be particularly effective if other utilities are invited so that all parties can be updated. Having a regularly scheduled meeting can ensure municipalities have an opportunity to raise issues and get answers. This may avoid or minimize the practice of pulling or withholding permits. Municipalities reported withholding permits because of non-responsiveness from the gas company. While this can be an effective tool, it slows down gas main replacement work during a relatively short construction season. 1. Consider not requiring curb-to-curb repaving during the street-cut moratorium. In instances where the municipality has not regularly provided the gas company with a list or map of its street-cut moratorium, municipalities should consider allowing the gas company to install a permanent patch over the trench, rather than repave curb-to-curb. If the gas company did not have access to information about which streets to avoid, it is unfair to penalize them for not avoiding them. A sub-set of municipalities interviewed by the project did already allow permanent patches, with the additional use of a infrared sealing, for trenches during the street-cut moratorium. Curb-to-curb repaving is much more expensive than trench restoration, which utilizes limited resources for paving that could otherwise be used to replace more leak-prone gas mains. 2. Link permits to gas company attendance at any construction season meetings. To ensure gas company attendance at the meetings during the construction season, make permit applications conditional upon their attendance. For example, in the case that the municipality decides to have a monthly meeting, if the gas company does not attend the meeting at the beginning of June, its permits for the rest of June would be withheld until it meets with the municipality. This will help increase the incentive for the gas company to attend the check-in meetings and hopefully reduce the instances of withholding permits. 1. Sign bilateral agreement to share savings from synchronized projects. The bilateral agreement should document any cost-neutral and cost-saving changes to DTE 98-22, how the gas company savings will be calculated, and how the savings will be shared by the gas company with the municipality. Additionally, the bilateral agreement should document the commitments made during the pre-construction season meeting that will facilitate coordination and project synchronization. This includes what type of plans and data will be shared, when parties will meet, how communication updates will be shared, etc. 1. Agree to share half of cost savings with municipality. For synchronized gas main replacement projects that generate cost savings due to coordination with municipal paving projects, agree that the gas company will share half of the savings with the municipality. Doing so will be cost-saving from the standpoint of the DTE 98-22 regulations because the gas company will avoid some or all of the cost of final paving. If half of those savings are provided to the municipality, the gas company will still spend less than budgeted that season on the gas main replacement project. Also, sharing the savings provides a strong incentive to municipalities to pursue and maintain coordination efforts. 2. Apply cost savings to additional leak-prone pipe replacement. If cost savings are applied towards replacement of additional leak-prone pipe, it can help the gas company stay on pace or potentially accelerate its timeline for leak-prone pipe replacement, while remaining on-budget. 1. Institute mechanism to use shared savings for municipal infrastructure projects. The goal of this best practice is to ensure that money saved through coordination returns to the departments responsible for the coordination, such as Public Works, Water and/or Sewer. Those departments can use the savings potentially to help fund its coordination efforts, such as paying for staff time to update infrastructure plans and input into GIS or to pave additional roads. By default, payments to the municipality will go into the general fund, eligible for allocation anywhere in the municipal budget. It is possible to create a special revenue fund so that payments are allocated to a specific department. A special revenue fund requires approval from the legislature. MAPC can help explore this if desired. In the interim, municipalities may want to seek informal agreement within the municipal government that the payments will be prioritized to be added to the appropriate department’s budget. 2. Start a cooperative program to leverage shared savings to incentivize more infrastructure repair across utilities. In the City of Worcester’s Cooperative Patching Program example, the Public Works department identifies areas where more than one utility needs to perform infrastructure upgrades, and the roadway is in need of repaving. However, repaving may not necessarily have been funded or planned. If the utilities coordinate their work in the same construction season, then the City allows them both to avoid final paving. In return, both utilities provide shared savings to the City. The City uses the savings to cover a portion of the curb-to-curb replacement cost. Without the shared savings, the City might not have been able to afford repaving the road. And if the City did not repave, the utilities would have had to incur all of the final patching costs. The result is a win-win that leverages the shared savings to get more infrastructure replaced and streets paved at a lower cost for both parties than would otherwise occur. Across all gas main replacement and municipal paving projects, not just those that will be coordinated, there ways to improve efficiencies to save time and money for both parties. Better management of new customers and developments may avoid cuts into roads under moratorium or recently repaved, reducing frustration and avoiding paving costs. The municipal permit system can be upgraded dramatically to reduce gas company and municipality administrative time, through measures such as email submissions and batch invoicing or through online permitting and payment. Improvements to the mark-out process exist for both the gas company and municipality to reduce incidence of damaged infrastructure and work delays. And targeted changes to the trench repair and tree planting approaches can result in better roads and tree survival while minimizing cost. 1. Do not direct-mail advertise to customers on roads under a street-cut moratorium. Where possible, gas companies should avoid actively recruiting new customers when their road is under a street-cut moratorium. Doing so can place the resident or business in conflict with the municipality, which has to refuse their request for installation of a new service. If the municipality acquiesces, then it results in a patch in an otherwise newly paved road. General marketing through web, online, radio, etc. cannot be expected to be targeted based on address, but the gas companies should be able to easily exclude addresses from direct-mail campaigns. Of course, this is contingent upon municipalities providing those addresses in their street-cut moratorium lists. 2. Identify ways to recruit new customers on roads before a street-cut moratorium starts. The gas company should focus efforts on recruiting new customers before a street get paved and is under a street-cut moratorium. This will be challenging, depending on how much lead time the municipality can provide the gas company on its plans for paving. Within this context, providing any additional financial incentives on gas equipment to customers who can convert before the moratorium begins may help. 1. Include address information in street-cut moratorium list. Gas companies will need this data to adjust mailings to avoid residents on roads with street-cut moratoriums. Using GIS can facilitate this process because addresses can be automatically stored along with the street segments. 2. Notify residents of opportunity to convert on roads that may be paved. Notifying residents of paving and infrastructure plans can be a useful service to set expectations and keep the community informed. The plans should be accompanied with a notice about the impending street-cut moratorium to encourage conversions to gas before paving. At the same time, the plans should make clear that they show priorities and are subject to change. Making a map public on the municipality’s website will likely be much less time intensive than trying to notify only the residents on specific street segments. 1. Process permits at least two weeks before the start of construction season. Allow the gas company to start work on the first day of the construction season, so that they can take full advantage of the short construction season to replace leak-prone pipe. 2. Implement batch payments or electronic payment for permits. Processing paper checks is time- and resource-intensive for municipalities, as well as the gas company. A few municipalities have chosen to invoice the gas company once or twice a year for all permit applications. This has reduced administrative time dramatically without the need for any new payment or technology systems. Longer term, implementing electronic payments would also streamline the payment process. It may require funding to acquire and support the software to manage the payments. 3. Implement email or online permit application process. The majority of permit applications are currently done on paper and must be hand-delivered or mailed in. Simply turning the application into a PDF document that can be filled in electronically then emailed to the municipality can substantially reduce the administrative burden for the gas company. If using a PDF, create a fillable form so that a user can type in responses. Otherwise, the user must print it out, handwrite answers in, then scan and email it back, which is not nearly as convenient. A few municipalities are currently using online permitting. This can generate efficiencies for the municipality too. Submission rules can ensure all necessary data is entered, drop-down lists can allow only valid road names and addresses, and the data will all be stored in a centralized location which facilitates searching and reporting. Additionally, the review and approval process can happen within the system, rather than requiring tracking separate files or pieces of paper. Some municipalities have online permitting in other departments, such as building permits, but not in Public Works. Those municipalities should look to expand their permits to street opening. 1. Mark out abandoned gas mains. Municipalities frequently reported issues with abandoned gas mains during excavations. These are generally not marked out during Dig Safe, posing a challenge and a safety risk. Municipalities will likely hand-excavate around the first main they find, and use the backhoe for the rest of the excavation. Not infrequently, that first main is actually an abandoned main. As a result, the municipality is then much more likely to hit and puncture the live active main later on. Where gas company records show an abandoned main, it should be included in the Dig Safe mark-out. Moving forward, gas companies should track the location of an abandoned main so that they can mark it out in the future. 1. Clarify with gas company if and when it will mark out abandoned mains. The municipality should seek to have the gas company mark out abandoned mains when its records indicate their presence. Through discussion with the gas company, confirm whether this is possible and be clear how the presence of an abandoned main will be communicated. 2. Report errors with mark-outs using Dig Safe form. Gas company records are not always accurate. Some of the pipe is over 60 years old, and records may have been lost, abandoned pipe not tracked, or soil conditions have changed the depth and location of the main. If and when municipalities discover errors with mark-outs, they should use the Dig Safe report form so that the gas company can be notified of issues with its data or identify the source of mark-out errors. 3. Call Dig Safe before excavating for municipal projects. Gas companies reported that some municipalities rarely call Dig Safe before they perform their own excavations. This can result in hits to infrastructure and dangerous punctures. Municipalities should make a committment to call Dig Safe before any excavation. 1. Explore ways to ensure sufficient time to move gas gates. Ideally, with improved notice by paving contractors of schedule changes, there will be fewer instances where union labor is unavailable. In the interim or when notification is short, consider options to improve response rate. This could include having the option to let qualified outside contractors move the gates or hiring additional union contractors. In either event, the goal is to avoid the cost and disruption of having to excavate and raise them after paving. Eversource has piloted a soil compaction meter on some trenches with the Cities of Marlborough and Cambridge. The use of the tool could be expanded if it demonstrates improved compaction and less settling over time. 3. Share data with municipality on frequency and result of paving patch inspections. Municipalities felt that gas companies were not adequately inspecting their paving patches for settlement and pavement quality. Meanwhile, gas companies reported actively tracking their inspections and results. This disconnect indicates information is not being shared. Simply sharing the inspection data with municipalities would increase transparency and help prove that the gas company is in fact performing inspections and repairs. Alternatively, it may highlight that not enough inspections are happening, in which case actions need to be taken to remedy the situation. 4. Use plastic ownership tags for patches. For both leak repairs and gas main replacements, put plastic ownership tags in the patch. This will avoid future confusion about the responsibility for inspection and repair of failed patches. 1. Request data on frequency and result of paving patch inspections. Gas companies reported actively tracking their inspections and results, despite most municipalities reporting the perception that inspections hardly happen at all. Municipalities should request the records of paving inspections on some regular basis during the construction season. If patches are not being inspected, or inspections are passing patches that really should fail, the municipality can have a more informed discussion with the gas company about how to improve. 2. Request gas company use plastic ownership tags for patches. For both leak repairs and gas main replacements, request that the gas company put plastic ownership tags in the patch. This will avoid future confusion about the responsibility for inspection and repair of failed patches. 3. Do not request use of “flowable fill”. Gas companies report that their primary opposition to “flowable fill” is that it can change the way that leaked gas migrates out of a leak. This can make it more difficult for them to locate leaks in the future. To achieve better compaction and less settling, talk with the gas company about using a soil compaction meter during the restoration process. Eversource has piloted these in the Cities of Marlborough and Cambridge. 1. Require that an arborist or tree contractor check soil in tree pits for the presence of natural gas. Natural gas in soil forces out oxygen, which is vital for the roots. When planting new street trees or replacing dead trees, it is important to check for the presence of gas in the air below ground. If gas exists, it may damage or kill the new tree. Municipalities could purchase a Combustible Gas Indicator used to check for gas when planning street tree plantings. Municipalities could also look at the annual gas leak data and the map of pipe material - hopefully shared by the gas company - to identify if the area near the tree is likely to have gas leaks. 2. Prohibit planting if natural gas is found below the soil. If gas is found, make sure to report the gas leak to the gas company immediately. Do not plant a tree until the leak is fixed or cleared by the gas company. If greenery is needed, consider placing a planter on the site for flowers and shrubs in the interim. "....contractor is required to provide at least three weeks notice of the street paving schedule to all utilities."